our 5th day in paris was a day of good and bad accidents when it came to eating. early in the day we tried out a well-reviewed japanese restaurant in the 1st–but it sucked. we ordered 4 things and none of them were even good, let alone picture-worthy so i have nothing to share with you. in the evening, we tried to sneak into le chateaubriand at the last minute (sister restaurant to la famille) but it was just too busy. there were at least 4 parties ahead of us who had the same idea. so being in the oberkamph/11th area, we decided to walk around and see what else looked interesting. we passed at least 3 of the bars that we'd read were really fun these days, as we headed down rue jean pierre timbaud, and finally settle on l'homme bleu for dinner. this little north-african restaurant looked very cozy and down-to-earth, sorta packed but still some room. 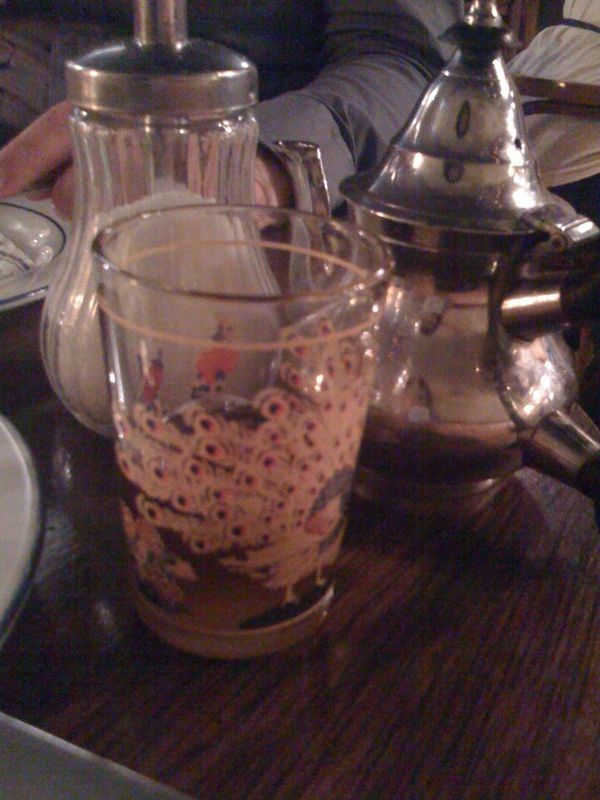 there is some great north african food in paris. the last time i visited, my friends and i had a great meal at le souk. but i think l'homme bleu is much better. the tagines were so flavourful and the couscous was the best i've ever had (i soooo do not make good couscous, i've realized. i need to be much more attentive to it) and the mint tea blew my mind. believe it or not, this picture of the tea is the best i have to share with you from the whole meal–it was really dark in there, lit mostly by candles which is not usually the case in paris. but while i loved the food, the real reason i'd go there again was for the atmosphere. the staff were so laid back and friendly that it looked like they were doing nothing, but all of the food and drink came out quite quickly. and even by paris standards, the diners lingered at their tables for a really really long time. a mix of friends and couples, everyone really seemed relaxed and happy and to be enjoying their companions a lot. it was nice to be around.